Guess what arrived in the mail today? The four new Picture Polish Collaboration Shades. Yippee. I was so excited for these ladies yesterday when I started seeing them appear on Facebook, but I was even more excited when I discovered the girls at Picture Polish had already sent them to me for review! I had this afternoon off work, so I had time to swatch them all for you, and I think you will love them - I know I do. 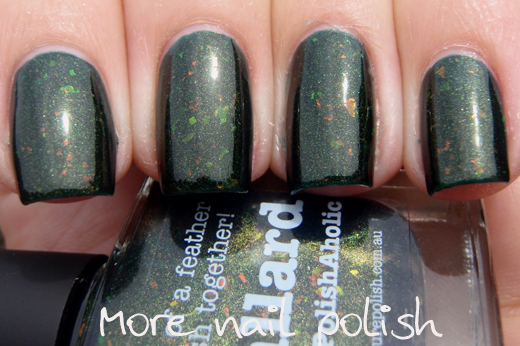 Mallard - by Jen from the PolishAholic. 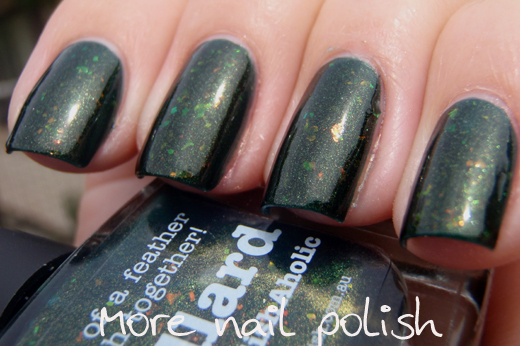 Mallard is a rich dark green polish with a strong golden green shimmer. 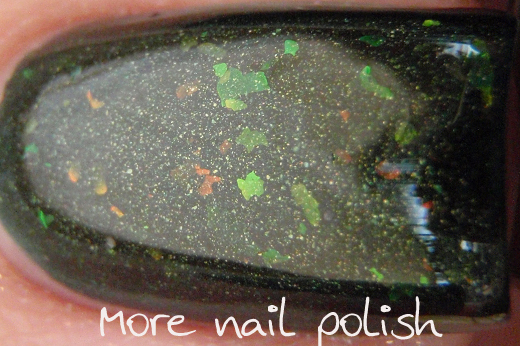 It also contains some awesome copper and green flakies. 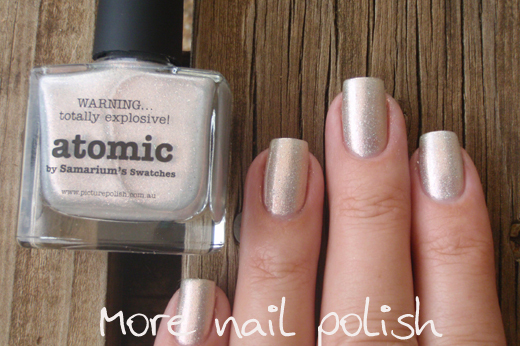 I love that this polish has two different things to offer. An amazing shimmer for when you are in the sun or with bright light, plus the green and orange flakies for low light situations. I bet this would also look pretty awesome with a matte top coat. 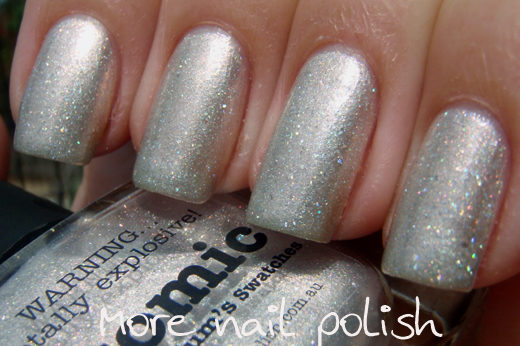 This is such a fabulous winter shade. It also makes me think of it as a green version of Orly's Fowl Play, which is funny given this polish's name is a breed of duck. 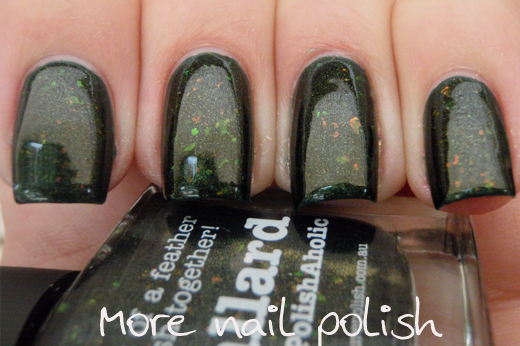 I also love the tag line at the top of this bottle "Birds of a feather polish together"! If you haven't already, you should check out Jen's blog post about Mallard, where she shares her name inspiration as well as some amazing photos. 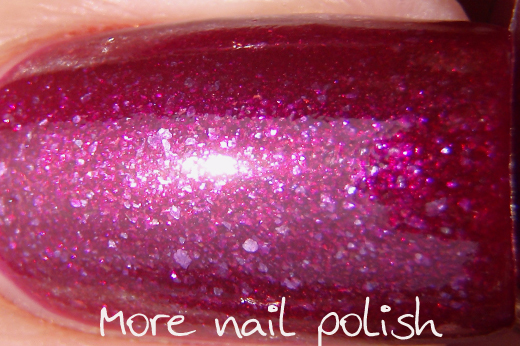 The formula was excellent and it was beautifully opaque in two coats. I chose to do two coats of top coat to ensure the flakies were beneath a glassy smooth finish. These first four photos show Mallard in the shade. These photos show Mallard in the smokey hazed 34 degree sun this afternoon. The smoke haze meant I wasn't able to capture the shimmer very well. But Jen's shots show it nicely. Sarah was right when she posted about this one yesterday, it sure is hard to describe. 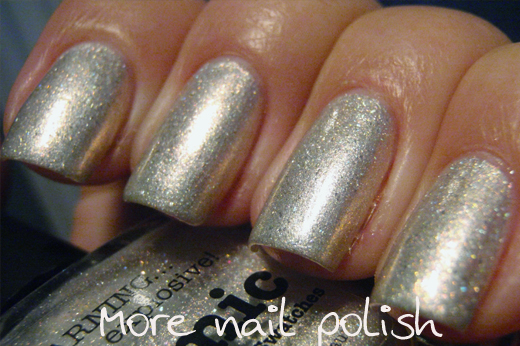 First of all, this isn't just a regular silver scattered holographic polish. This is much more complex, and of course that complexity isn't something I was able to capture today with the bushfire smokey haze hanging about. 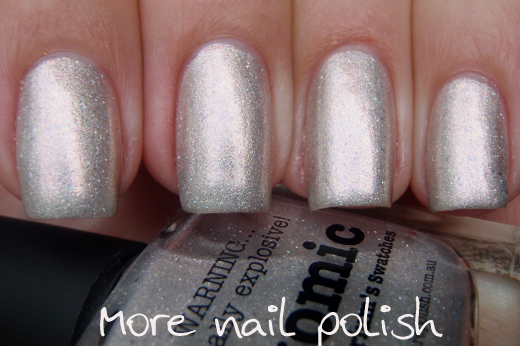 Atomic has a silvery white shimmery base which provides a gorgeous pearl like finish, but without any sign of frostiness at all. 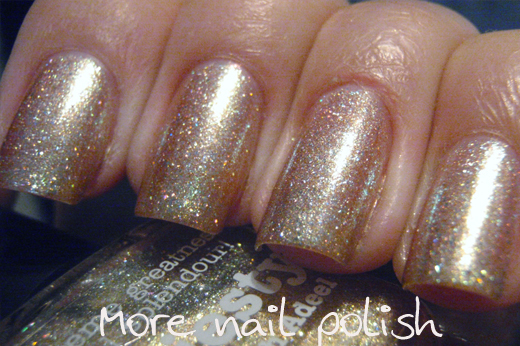 The base also has some pink and gold shimmer in it, and its those two colours that warm this polish up compared to other silver polishes. Then of course there are the scattered holographic shards that reflect a rainbow when viewed in the sun or under stronger light. Sarah has some stunning macro shots of this, as well as layerings over other colours, so don't forget to check out Sarah's blog post about Atomic. I did three thin coats of Atomic for these photos. The formula was great and it dried fast. A really beautiful shade that really needs to be seen in person to appreciate it's beauty. I love that this one is sheer enough to be able to use for laying, but opaque enough to build up and wear on it's own. Focus - by Sheila from Pointless Cafe. 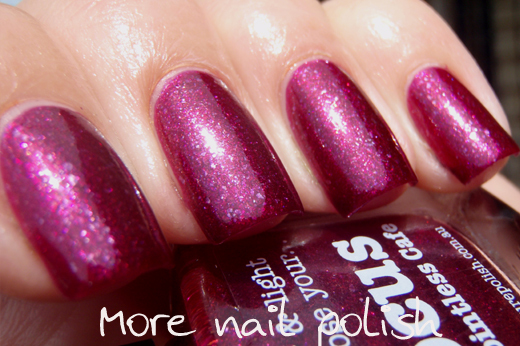 Focus is a smooth and bold violet red with lots of micro flakies. The micro flakes are silver and blue, but the tinted base makes the silver ones look a vibrant pink and the blue ones look rich purple. 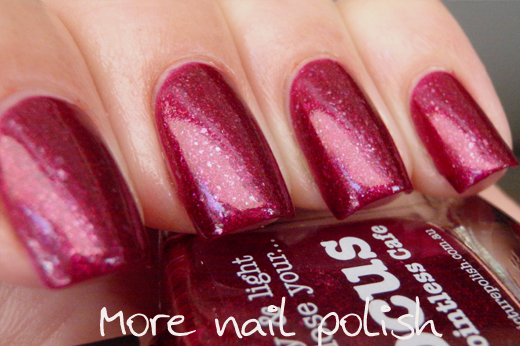 Sheila shares photos of her inspiration for this shade in her blog post about Focus and well as swatches on both long and short nails. 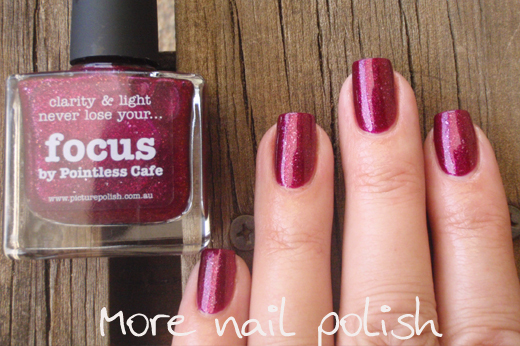 Focus was perfectly opaque for me in two coats and one coat of top coat had those micro flakes really glowing. 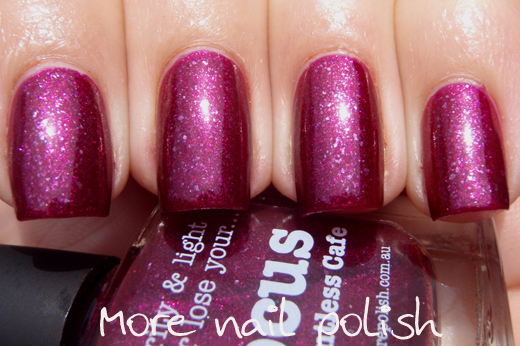 Lovers of reds and plum shades are going to love this one. These photos are a mix of in the shade and in the hazy sun. 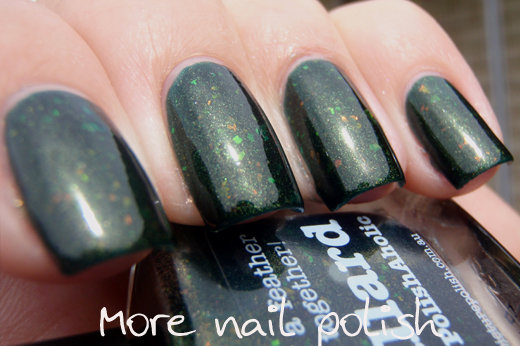 Until I saw this polish this morning, I was not actually familiar with Sarhish's blog. 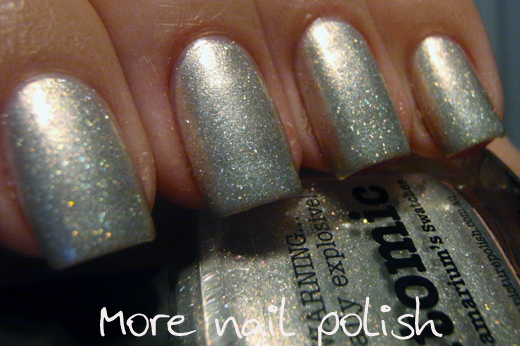 But now I am and I have to say, Sahrish, I'm totally in love with this polish. Last year when I started collaborating with Picture Polish to create Kryptonite, I originally had the idea to create a gold polish. But the truth was, I couldn't really think of anything new or unique to create with a gold polish. 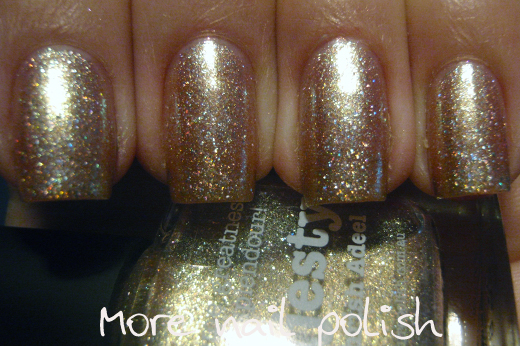 There were so many gold polishes out there, mine would be just another. 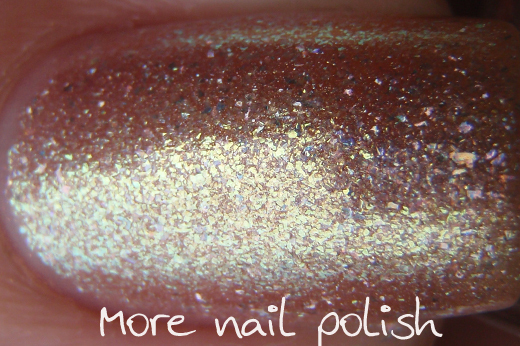 Especially as I already loved Ozotic 604 the gold scattered holo. Sahrish and Picture Polish have come up with something new here. This polish is just gorgeous and it really is unique in my stash (and with the number of gold polishes I have, that's really saying something). 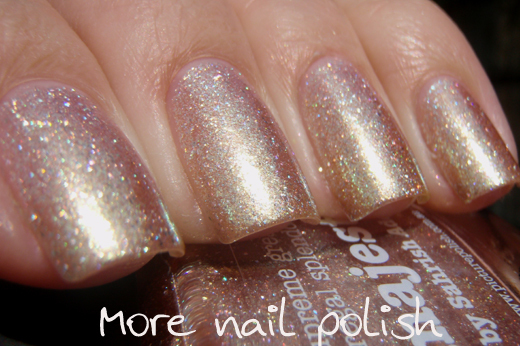 The base for this polish is actually a light beige pink and the gold colour is created by micro gold glass flecks. Sound familiar? 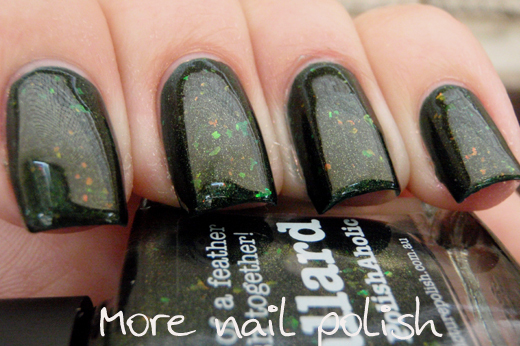 It should because it's very similar to one of my top polishes from last year - Pretty Serious Mummy Mush. It even has the same subtle colour shift in the gold flecks that turns blue. But, this also has the larger irregular shaped scattered holographic particles. Sahrish requested a shade that would be suitable for any age and any skin tone. This might just fit the bill. It's cool toned and one of these neutral or 'wearing nothing' types of gold. I know I'm going to have to hide my bottle or my 65 year old mum is gonna steal it! I love my Kryptonite, but this one is a very close second, probably beating out my other top Picture Polish from last year, Cosmos. 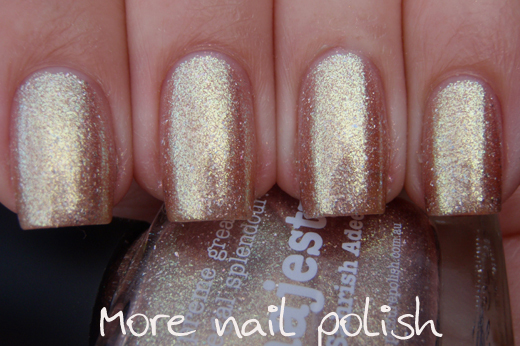 But just remember ladies - I am obsessed with gold polishes! I applied three coats of Majesty to get it opaque, but it dried fast. Photos below are a combination of shade, hazy sun and indoor incandescent lighting. All the new collaboration shades are now available on the Picture Polish website and will be available soon through the various Network members. Love Majesty in the sun. Gold and holographic glitters make an awesome combination. These are all so gorgeous. I may be drooling right now. That Mallard is sooooo gorgeous! Oh, these are all amazing! These swatches are lovely! Focus is my favorite and I really like Mallard too! You captured them all very well! Love seeing these all on you! And seriously isn't Atomic SO hard to capture? You did a terrific job though!! Thank you so much for showing it off so beautifully! Thank you for creating such a beautiful shade. I really want to wear it again so I can try to capture more of its beauty. I also want to try some layering. Thanks Jen, and thank you for your beautiful creation! hey there how do we order? Im in Ontario Canada? Both Harlow&Co and Nail Polish Canada stock Picture Polish in Canada. Thank you Sahrish - I really love it! 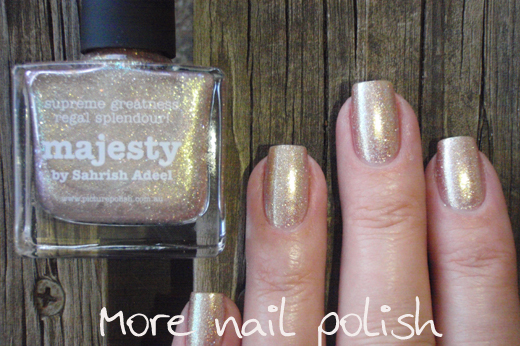 Yes, I will certainly try both Majesty and Atomic over some other colours too! 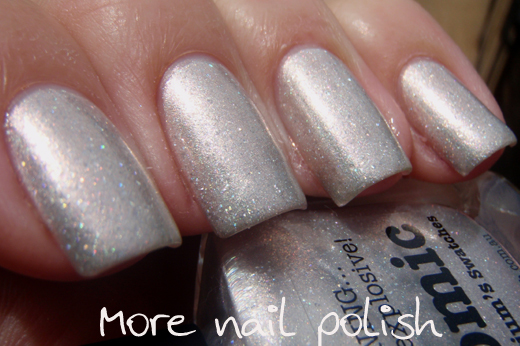 Kudos to Picture Polish for their Collaboration Shades. It shows they really do listen to their customers with fantastic results. Great swatches as ever. EU AMO ESMALTE ,MAS INFELIZMENTE SOU ALERGICA. SERÁ QUE ESTES SÃO ANTIALERGICOS?